Have you been told that you have a gummy smile? Maybe your teeth appear narrow or tilt inward? To expand your arch, there are several lengthy and invasive procedures that can be used; however, you really do not want to undergo the hassle. Now, you can widen your smile with porcelain veneers in Ft. Collins, CO. The simple, minimally invasive procedure allows you to broaden the appearance of your teeth in as little as two appointments. At Aspen Dental Care, Dr. Shiloh D. Lindsey will transform your confidence with a natural-looking solution that offers three amazing benefits. When compared to traditional dental veneers and other cosmetic procedures, this solution is minimally invasive. Porcelain is thinner than other materials. 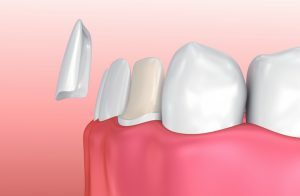 As a result, less of the tooth’s structure is removed during the bonding process. This not only makes the procedure less invasive, but also decreases the risk for tooth sensitivity. In addition, porcelain also closely mimics the appearance of enamel so it creates natural-looking results. Porcelain is also stain-resistant, so with the right aftercare, your new smile will stay bright and white. When you have a narrow, unattractive smile, it hurts your self-esteem. You often feel judged by the appearance of your teeth, which can negatively impact your social and career engagements. Now, you can restore your confidence while resolving your insecurities. You will love your new smile for many years to come as veneers will last an average of 10 years with the right aftercare. In addition to broadening your smile, you can also use veneers to resolve several other imperfections. By placing the thin shells on the front side of your teeth, they will become several shades whiter as tough discoloration and stains are hidden. In addition, they improve the size and shape of your teeth overall, which is perfect for those with chipped, cracked, or abnormally shaped teeth. In some cases, they can also be used to hide alignment issues, which is the perfect alternative to traditional braces. Now, you can get a straight smile in as little as two appointments. If you are tired of feeling insecure about your narrow or small smile, your cosmetic dentist in Ft. Collins, CO can help. Dr. Lindsey will perform a comprehensive consultation to ensure porcelain veneers are right for you. On average, if you have healthy gums and teeth while being proactive about your dental health, you are a candidate. After your consultation, a comprehensive treatment plan is created to begin transforming your smile. During your first appointment, your teeth are cleaned and prepared. Impressions are taken to create your new smile. While you wait for your permanent ones, temporary veneers are attached. A couple of weeks later, you will return for your second and final appointment to have the final ones bonded in place. If you are ready for a minimally invasive approach to widen your smile, contact our office today to schedule your consultation.